Sealaska Heritage Institute (SHI) in partnership with the T’a̱kdeintaan Clan, Mt. Fairweather House of Hoonah has acquired infrared scans and enhanced photos of an old Tlingit box drum that reveal design elements previously not visible to the naked eye. The images exposed more of the formline design on the drum, which was repatriated in 2011 to the T’a̱kdeintaan. “The original formline was very faded with age but through the project, we were able to see two faces that were not as visible before and more of a salmon design on one side of the drum, among other things,” said SHI President Rosita Worl. Infrared is used to detect heat in thermal imaging, but because the box drum is inert and does not produce heat, the lens picks up pigments that optically aren’t as apparent. Through the project, which was funded through a grant from the Museums Alaska Collections Management Fund, SHI hired photographer Brian Wallace, who produced black-and-white infrared scans. The scans exaggerated the details rendered in black, making the formline designs more decipherable. He also used photo software to produce color images where the reds were oversaturated, revealing details rendered in red. The grant also allowed SHI to hire a professional ethnographic object conservator to perform a critical-condition assessment, do general cleaning and, after consultation with the Mt. Fairweather House, carry out conservation treatment to stabilize the drum so it could be displayed in SHI’s Nathan Jackson Gallery. It will be available in time for First Friday in September. The drum currently is on long-term loan to SHI, which will make it available to T’akdeintaan Clan members, scholars, artists and other researchers. The drum also will be on display in the Nathan Jackson Gallery in the near future. The box drum has a storied history. It was sketched by the German geographer and author Aurel Krause during his visit to Hoonah in the late 1800s. Krause later published the sketch in his book Die Tlinkit-Indianer: Ergebnisse Einer Reise Nach Der Nordwestküste Von Amerika Und Der Beringstrasse, which translates as The Tlingit Indians: Results of a trip to the Northwest Coast of America and the Bering Strait. In 1924, the drum was collected by Louis Shotridge for the University of Pennsylvania Museum of Archaeology and Anthropology. The T’a̱kdeintaan Mt. Fairweather House—in partnership with the Hoonah Indian Association, Huna Totem Corporation, Huna Heritage Foundation, Sealaska and SHI—in the late 1990s launched a vigorous campaign to repatriate the drum and nearly 50 other items housed at the museum. The parties argued before the Native American Graves and Repatriation Act (NAGPRA) Review Committee in 2010 that the 1924 transaction was illegal because the T’akdeintaan Clan never agreed to alienate the objects. 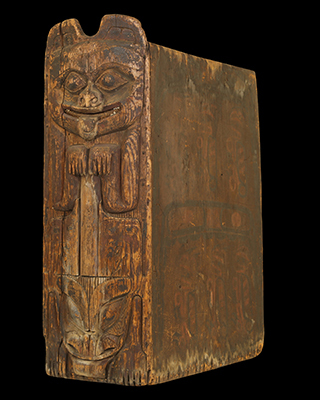 The committee sided with the Native groups, and in 2011, the museum repatriated eight of the pieces, including the box drum. The museum returned three additional items to the clan recently in a ceremony at SHI and will return the remaining 35 in the near future. Captions: From left, untouched photo of one side of the drum followed by an infrared scan and an image where reds were oversaturated in photo software; Tlingit box drum. Photos by Brian Wallace.